Storey Publishing, LLC, 9780882665450, 160pp. Offering a regimen of preventative care that will ensure your horse’s long-term health, this guide covers everything from selecting a healthy horse to dealing with pregnancy, equine nutrition, and the special needs of older horses. 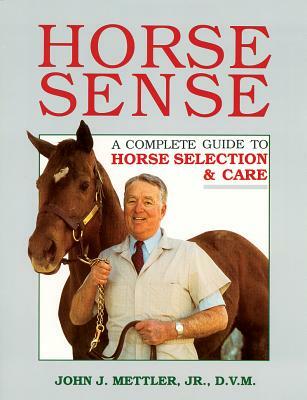 Providing in-depth discussions of immunizations, worming, and dental care, Horse Sense also includes techniques for effectively treating common maladies like colic, choke, and founder. Monitor your animal’s health, prevent debilitating illnesses, and keep your horse thriving and happy for years to come. John J. Mettler, Jr., D.V.M., is a retired large-animal veterinarian in upstate New York and has written several books on animals, including Basic Butchering of Livestock & Game and Horse Sense. An avid sportsman, his appreciation of the noble turkey was the inspiration for his most recent book, Wild Turkeys. John has written on a broad range of veterinary topics for various magazines and has written a veterinary column for American Agriculturist for over 20 years. He has professional memberships that include the New York State Veterinary Medical Society (past chairman), the American Association of Equine Practitioners, the Society for Theriogenology, and the American Veterinary Medical Association.